Sign calls religion a myth that "hardens hearts and enslaves minds"
(CNN) -- An atheist sign criticizing Christianity that was erected alongside a Nativity scene was taken from the Legislative Building in Olympia, Washington, on Friday and later found in a ditch. 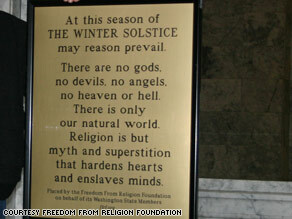 The Freedom from Religion Foundation had a placard up in the Legislative Building in Olympia, Washington. An employee from country radio station KMPS-FM in Seattle told CNN the sign was dropped off at the station by someone who found it in a ditch. "I thought it would be safe," Freedom From Religion Foundation co-founder Annie Laurie Gaylor told CNN earlier Friday. "It's always a shock when your sign is censored or stolen or mutilated. It's not something you get used to." The sign, which celebrates the winter solstice, has had some residents and Christian organizations calling atheists Scrooges because they said it was attacking the celebration of Jesus Christ's birth. "Religion is but myth and superstition that hardens hearts and enslaves minds," the sign from the Freedom From Religion Foundation says in part. The sign, which was at the Legislative Building at 6:30 a.m. PT, was gone by 7:30 a.m., Gaylor said. The incident will not stifle the group's message, Gaylor said. Before reports of the placard's recovery, she said a temporary sign with the same message would be placed in the building's Rotunda. Gaylor said a note would be attached saying, "Thou shalt not steal." "I guess they don't follow their own commandments," Gaylor said. "There's nothing out there with the atheist point of view, and now there is such a firestorm that we have the audacity to exist. And then [whoever took the sign] stifles our speech." Gaylor said that police are checking security cameras pointed at the building's entrances and exits to see if they can see anyone stealing the sign. "It's probably about 50 pounds, " Gaylor said. "My brother-in-law was huffing and puffing carrying it up the stairs. It's definitely not something you can stick under your arm or conceal." The Washington State Patrol, which is handling the incident, could not be reached for comment. Dan Barker, a former evangelical preacher and co-founder of the group, said it was important for atheists to see their viewpoints validated alongside everyone else's. "It's not that we are trying to coerce anyone; in a way our sign is a signal of protest," Barker said. "If there can be a Nativity scene saying that we are all going to hell if we don't bow down to Jesus, we should be at the table to share our views." He said if anything, it's the Nativity scene that is the intrusion. The scene in Washington state is not unfamiliar. Barker has had signs in Madison, Wisconsin, for 13 years. The placard is often turned around so the message can't be seen, and one year, someone threw acid on it, forcing the group to encase it in Plexiglas. In Washington, D.C., the American Humanist Association began a bus ad campaign this month questioning belief in God. "Why believe in a God?" the advertisement asks. "Just be good for goodness sake." That ad has caused the Washington Metropolitan Area Transit Authority to field hundreds of complaints, the group said, but it has heard just as much positive feedback, said Fred Edwords, the association's spokesman. Edwords said the ad campaign, which features a shrugging Santa Claus, was not meant to attack Christmas but rather to reach out to an untapped audience. Edwords maintains the campaign began in December mostly because the group had extra money left over for the year. The connection to Christmas is a coincidence, he said. "There are a lot of people out there who don't know there are organizations like ours to serve their needs," Edwords said. "The thing is, to reach a minority group, in order to be heard, everyone in the room has to hear you, even when they don't want to." The ad campaign, Edwords said, is to make people think. He said he doesn't expect to "convert" anyone. But the Christian Coalition of America is urging members to oppose the advertisements. "Although a number of humanists and atheists continue to attempt to rid God and Christmas from the public square, the American people are overwhelmingly opposed to such efforts," Roberta Combs, the group's president said in a press release. "We will ask our millions of supporters to call the city of Washington, D.C., and Congress to stop this un-Godly campaign." As far as the criticism goes, Edwords said there are far more controversial placards in Washington. "That's D.C. -- this is a political center," he said. "If I can see a placard with dead fetuses on it, I think someone can look at our question and just think about it." The anger over the display in Olympia began after it was assembled Monday. The sentiment grew after some national media personalities called upon viewers to flood the phone lines of the governor's office. The governor's office told The Seattle Times it received more than 200 calls an hour afterward. "I happen to be a Christian, and I don't agree with the display that is up there," Washington Gov. Christine Gregoire told The Olympian newspaper. "But that doesn't mean that as governor, I have the right to deny their ability to express their free speech." For some, the issue isn't even that the atheists are putting their thoughts on display, but rather the way in which they are doing it. "They are shooting themselves in the foot," said iReport contributor Rich Phillips, who describes himself as an atheist. "Everyone's out there for the holidays, trying to represent their religion, their beliefs, and it's a time to be positive." The atheist message was never intended to attack anyone, Barker said. "When people ask us, 'Why are you hateful? Why are you putting up something critical of people's holidays? -- we respond that we kind of feel that the Christian message is the hate message," he said. "On that Nativity scene, there is this threat of internal violence if we don't submit to that master. Hate speech goes both ways."